Ebola Early Warning System is an adware program that makes use of the current pandemics to trick users into downloading the application. Although it looks like a useful application, there is nothing beneficial about it, and if you happen to have Ebola Early Warning System on your computer, it means that you have installed multiple adware applications at the same time. Unless you remove Ebola Early Warning System immediately, you could get exposed to a number of potential computer security threats. While you are at it, invest in a licensed antimalware tool as well. Our research shows that Ebola Early Warning System used to have to two homepages at ebolawarnings.com and ebola.events.com. However, both websites are no longer available, and it does not seem like TheWay Holdings LLC (the creator of Ebola Early Warning System) is about to make a new one. Nevertheless, there are more ways to distribute adware applications than just upload the download link on the official website. Ebola Early Warning System clearly spreads via freeware downloads, so you need to be attentive whenever you download programs at third-party file sharing websites. The problem is that you most probably have downloaded and installed Ebola Early Warning System onto your computer willingly, even if you did not realize that. 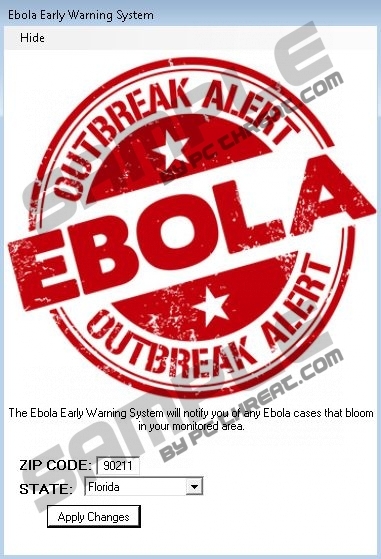 As far as Ebola Early Warning System’s function is concerned, this adware application is supposed to help you monitor the Ebola outbreak in your selected region. Although the use of such a monitoring tool is highly questionable, there is no doubt that a lot of users fall for this trick because they are scared enough to think that Ebola might reach them as well. However, rather than utilizing Ebola Early Warning System, you should consider all the potential security risks associated with the application. For example, our research team says that Ebola Early Warning System can act like an adware downloader, display annoying pop-ups and even redirect you to potentially corrupted websites. If this application can download more adware onto your computer, it means that Ebola Early Warning System can connect to a remote server behind your back and download more unwanted software without your permission. This presents specific computer security threats because malevolent third parties could make use of Ebola Early Warning System to promote their corrupted content. Therefore, it is necessary to remove Ebola Early Warning System from your computer at once. Unfortunately, this program does not have an entry on the list of installed programs, so you can’t uninstall it via Control Panel. To get rid of Ebola Early Warning System, you need to delete all the program’s files from %LCALAPPDATA% directory, like ebola.time, ebola.elerts, and so on. You also have to delete the autorun that is located in the Windows Registry at SOFTWARE\Microsoft\Windows\CurrentVersion\Run\Ebola EWS. However, if you think that manual removal is too complicated for you, you should invest in a licensed antispyware tool that would do the job for you. Take all the appropriate measures to get rid of Ebola Early Warning System for good. Quick & tested solution for Ebola Early Warning System removal.